A Jim Corbett Tour should definitely be on the cards for all – nature lovers or not. A tour of this fantastic sanctuary will definitely change any negative thoughts you might have harbored earlier. The flowing lush lines of trees in the deciduous forest, the songs of the birds and the excitement of spotting animals in wildlife will make you fall in love. If you are yearning for a small break that will allow you to get away from all the mad hustle and bustle of life, one of the Corbett weekend packages will be the ideal getaway. Since it is situated in the Nainital district it is very well connected and easy to reach from all over India. If you want a more comprehensive vacation or trip, there are numerous Corbett tour packages that you could take. While the shorter tours comprise of one safari trail, a longer package will truly allow you to explore the entire reserve, its flora, fauna and all the charm of living in a remote destination. Almost all Jim Corbett tour packages would consist of animal safaris (on jeep or elephant) that will take you through the reserve so that you can see the wildlife and most of all spot a tiger. However, depending on the length of your trip, you’ll only be able to tour a limited number of safari zones. 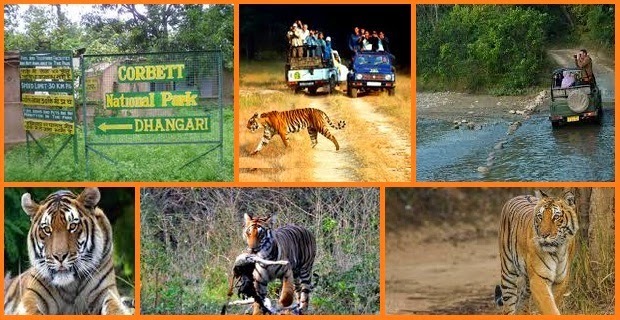 A Jim Corbett tour can take you through 4 safari zones namely Bijrani, Dhikala, Durga Devi and Jhirna. Spending more days will mean you can go to all the zones. This will increase your chances of seeing a tiger as not everybody is lucky – the tiger is a shy animal and very hard to spot! Apart from the tiger, treks and walks are also organized for people who want to experience the forest on foot or want to do a bit of bird watching. They will take groups into the reserve with a trained guide as tourists are not allowed to venture unassisted into the forest region for safety reasons. Corbett tour packages also consist of other activities like a visit to the museum. There is an artifact shop there where you can pick up mementos. Since the nights are cool, packages can also consist of barbecues or bonfire meals in the night, especially in the cooler seasons. There are various tour packages, each varying in the number of days for which one is staying, the place of accommodation, the activities and sightseeing during the trip and other additions like meals etc. Make sure to pick a package that helps you experience Corbett and does not get lost in the accessories. Before It’s Too Late: What Can be Done to Save Wildlife? © 2019 Corbett National Park , Inc. All rights reserved.